Even though I’ve tested the recipes in my cookbook hundreds of times, sometimes it’s necessary to refer back to the text–especially for those dishes that I don’t make that often. I’m usually the type who eschews measurements and cooks more by “feel,” but in these instances it’s good to cook by the book. And it’s always gratifying when the dish comes out as expected (or even better) because I know that if I get good results so will you. Though Fish Ambul Thiyal is one of my favorite dishes, I don’t make it that often because I have an Aunty who makes it infinitely better than mine. I think all that has changed after today, however. I felt a hankering for some Fish Ambul Thiyal, and I had some frozen tuna from Trader Joe’s thawing, so I decided to give it a go. 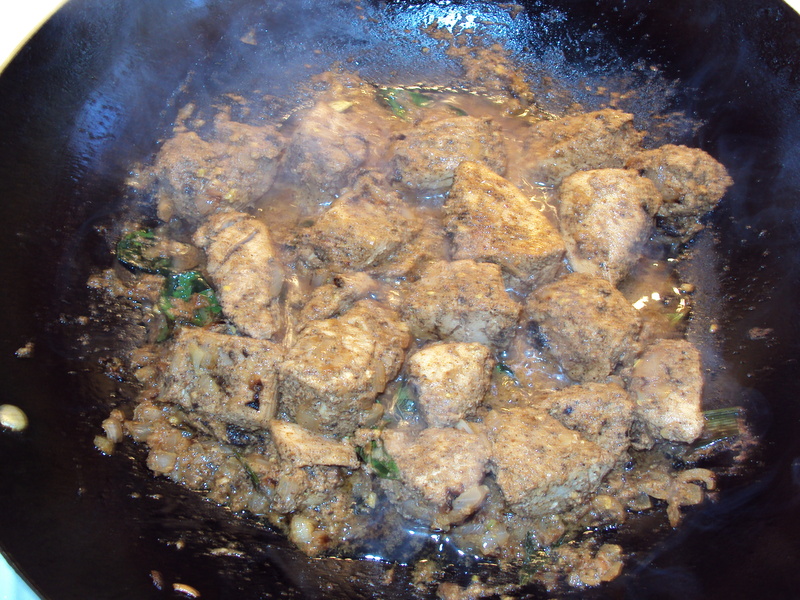 One special ingredient that you will need is goraka, which might only be found at a Sri Lankan store. A fitting substitute would be tamarind. 3.) Place the garlic, ginger, roasted spices, black pepper, fenugreek, goraka and salt into a food processor or blender and grind into a thick paste. Add a little water if necessary and coat the fish in this mixture. 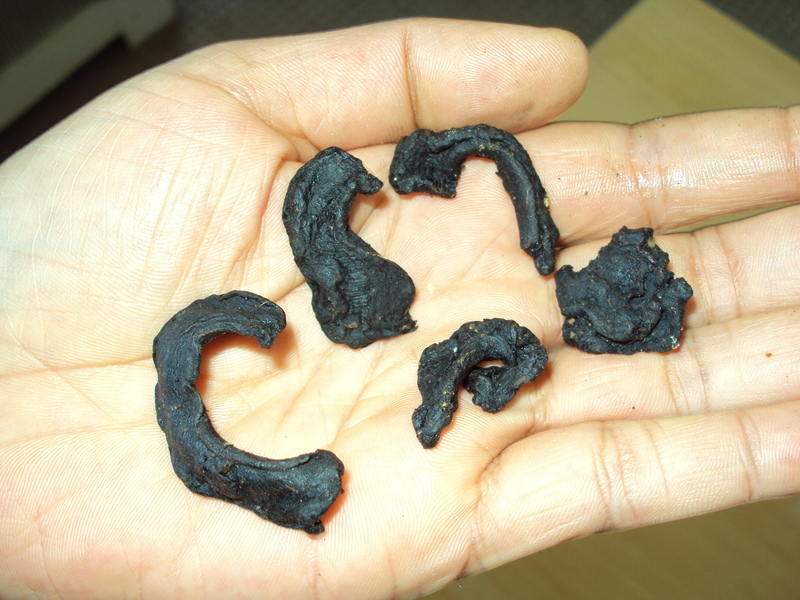 (Note: If you are using real tamarind fruit, soak the pods in 1/4 cup warm water. Strain and discard seeds and fiber and add to mixture. 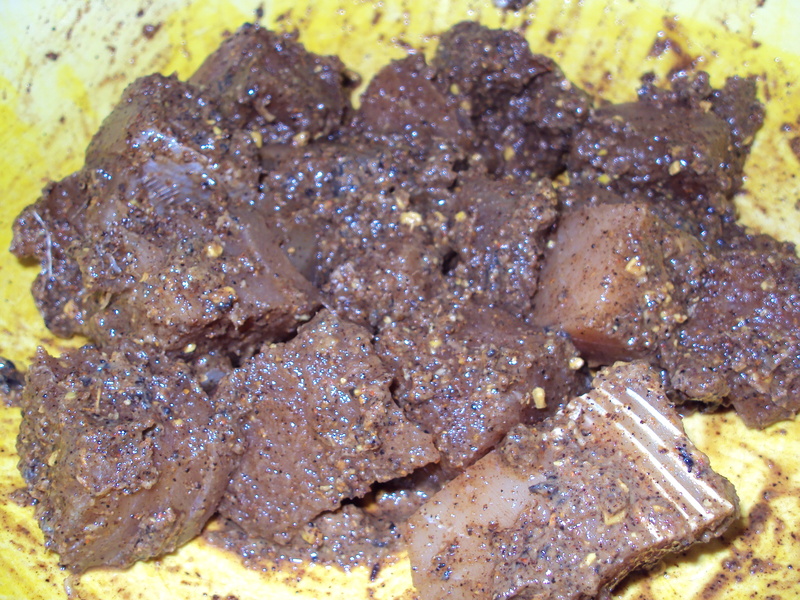 If you are using tamarind paste, use ony about a teaspoon since it is so concentrated). 4.) 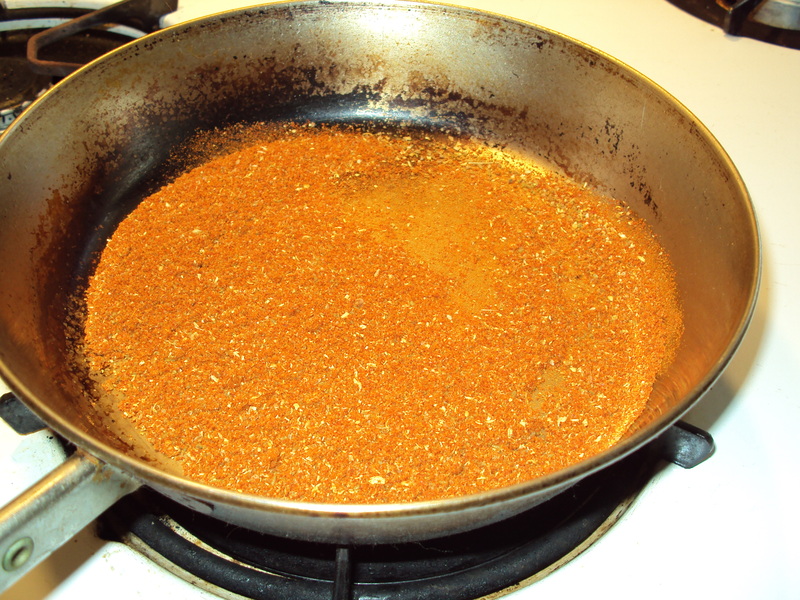 Heat oil in pan. 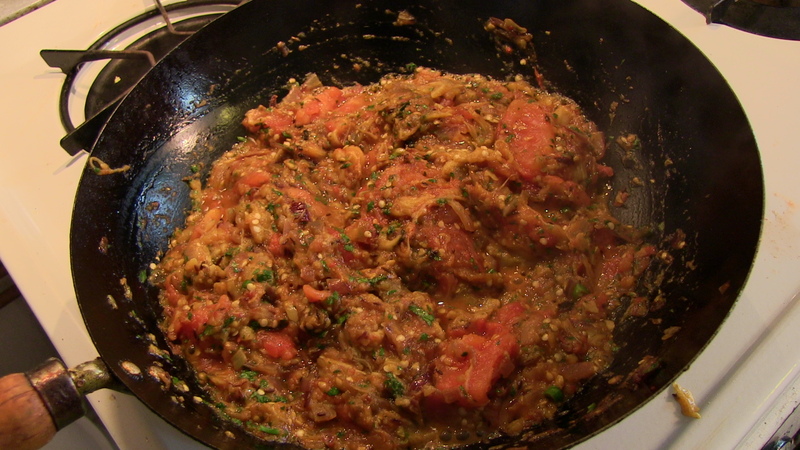 Saute onions, clove, cardamom, cinnanmon, and curry leaves until onion is translucent. 5.) 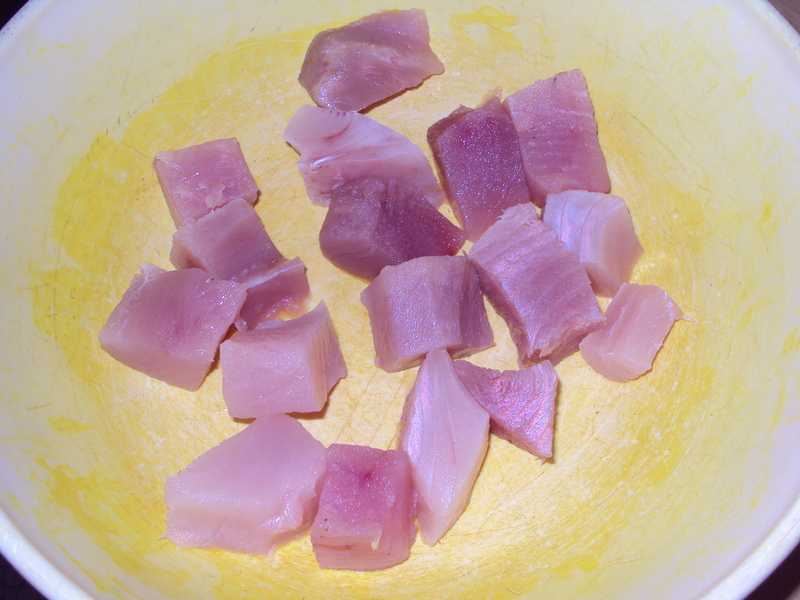 Place fish in the pan with water and remaining ingredients and bring to a boil. Reduce heat and simmer until all water has evaporated (about 20 minutes). No I don’t like more spicy. When it comes to food, Dee, the more the merrier! i agree with dee, skizz..the ambul is more than enough…check out dee’s blog, too. I love your site !! Curry is so great. This is an amazing dish I learned first from your book. It at first tastes kind of “weird” to the Western Palate… kinda purple, funky, sour and exotic… but it really grows on you fast. It really does taste better on day two and three. p.s. the lunch plate looks AMAZING. 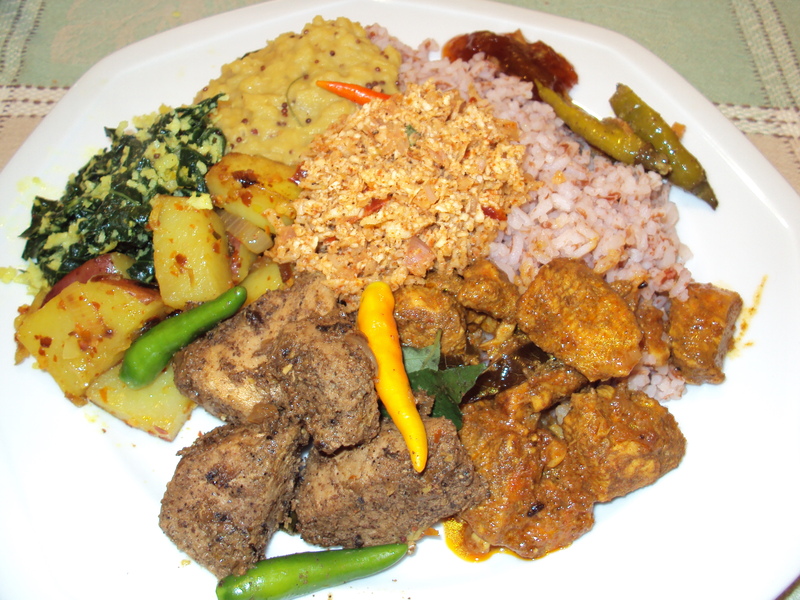 I love making rainbow coloered plates of curries and sambols. It’s a lot of effort but it is well worth it. if you don’t have Skiz’s book on Sri Lankan Home Cooking.. it’s also well worth it. Why didn’t I think you might have a blog? And I stumbled upon as my stomach felt like Ambul thiyal… gonna try it out with monkfish. So glad this exists… but makes my mouth water for all kinds of back home cooking. am about to try your ambulthiyal recipe..:) sounds good. hello…so I tried your ambulthiyal recipe. 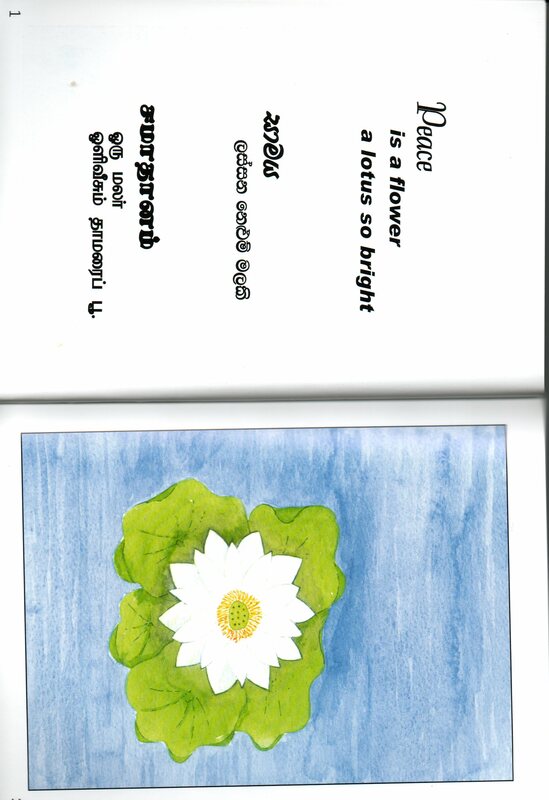 I was very skeptical because from my experience most sri lankan cookbook recipes just don’t get the taste right. Well, this one blew me away. It’s fantastic. Made it the day before and took it to a dinner with some indian friends and they devoured it. Thank you! So, that is enough proof for me –I will be buying your book. Thanks, Arunie. This is one of my favorite dishes, so I had to get it right. Glad you enjoyed it, too! Thanks, Ayesha. Hope it turns out well. 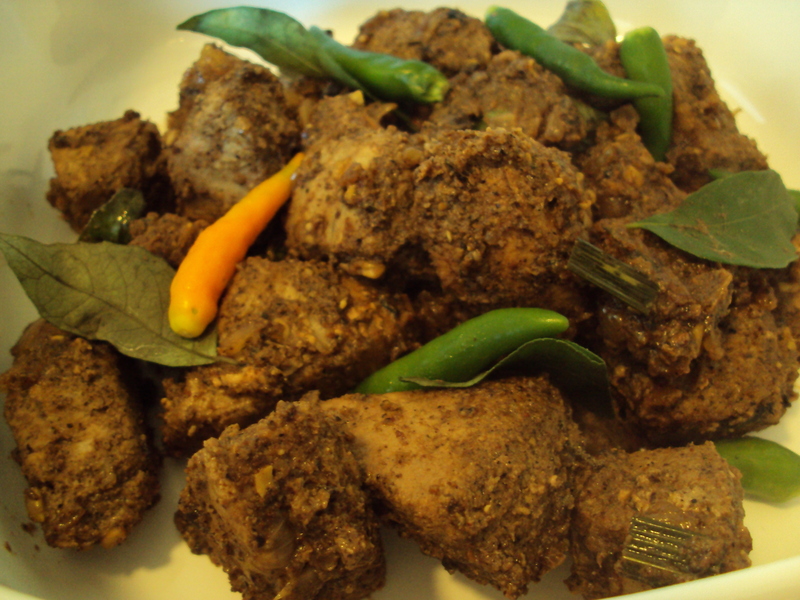 I made this ambul Thiyal for this christmas party. It was so tasty.thank you have a nice holiday. Thanks, Praba. Glad you enjoyed it! talking about on the internet. You actually understand how to bring an issue to light and make it important.